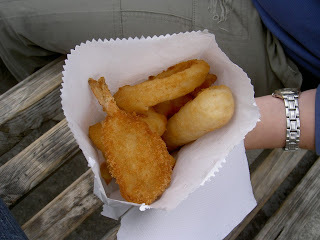 Here's a W&F Top Tip: if you are in Hobart, take the advice of Flippers Seafood and order yourself a Bag of Treats. Along Constitution Dock are four 'floating wharves'; two selling fresh seafood for you to take home and create your own masterwork, and two selling cooked seafood. Flippers (closest to town) has an extremely approachable menu, once you get your head around just how many choices there are! In this seafood savvy town there is rarely something as straightforward to order as just 'fish and chips'. Here you can pick exactly which variety of piscine meat you want encased in batter - trevalla, blue grenadier, couta, etc. There is a daily special, based on that morning's catch, as well as packs galore. And then there are the various morsels, each of which you can order individually and hence mix and match to put together your own paper bag of fried fish heaven. I approached the morsel situation with some guidance, going for Flippers Bag of Treats. I've received good value fish and chips with change from $8 before, but this $7.20 bag of deliciousness was absolutely the gastronomic highlight of the trip (and only just pipped for Number 1 Highlight overall by the fact that we saw a wombat in the wild!). From the menu, the Bag comprised of: 1 x battered scallop, 1 x garlic prawn, 1 x prawn cutlet, 1 x crab stick, 2 x seafood bites, 2 x calamari rings. I scored a bonus Bag, with an extra portion of both garlic prawn and scallop, both of which were so moaningly wonderful I couldn't believe my luck. I didn't expect much from a crab stick but it too was sensational. The calamari rings were plump and one could actually bite through the ring and keep the batter-flesh union intact. The seafood bites (in picture below) were surprisingly dense and covered in more of a crumb than a batter. Each reach into the bag had me expectant to discover which new portion of fabulousness I was about to bite into. SG got seafood envy and mixed and matched to get himself a bag with three seafood bites and a small serve of chips. 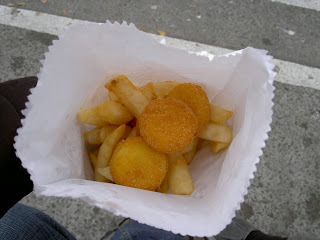 As would be expected, their chips were also superb (Tasmania does also do a rather fine line in potatoes). Plenty of crunch, but not overcooked. This was the holiday moment where you start to wonder if you need to pursue any other food avenues in town, or instead return to what you've just discovered for a second, third, fourth experience. Welcome back! I thought you were pinned under a piano, somewhere. Of course, Hobart... well, that's dire in itself! But that seafood does sound bloody awesome. Ta! I was indeed un-computered for a week and since I've been back I've been sitting on the Tas posts - hoping to get them all up together (there's more to come).